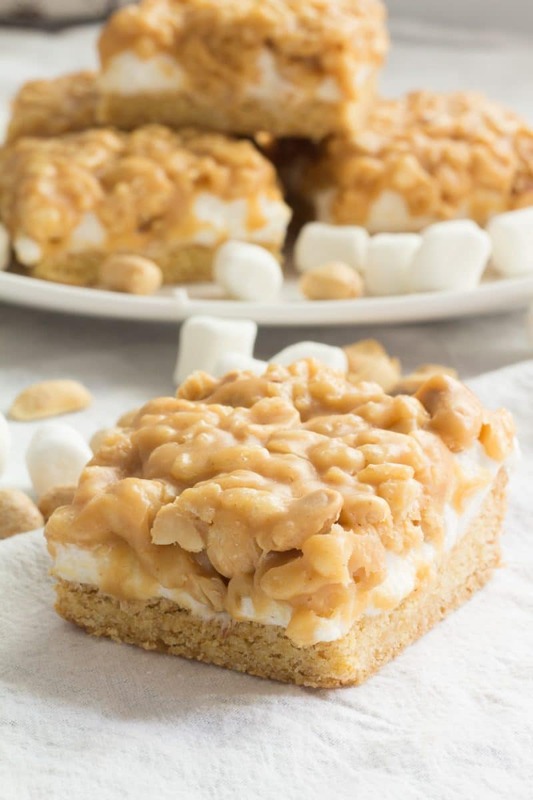 Salted Peanut Marshmallow Bars are easy to make and tastes like Payday Candy Bars. Great for afternoon snacks and packing in lunches! This is one of our favorite dessert recipes. It is pretty sweet, so a little goes a long way. These cookie bars that taste like PayDay bars are perfect for packing into lunches or as an afternoon pick-me-up. 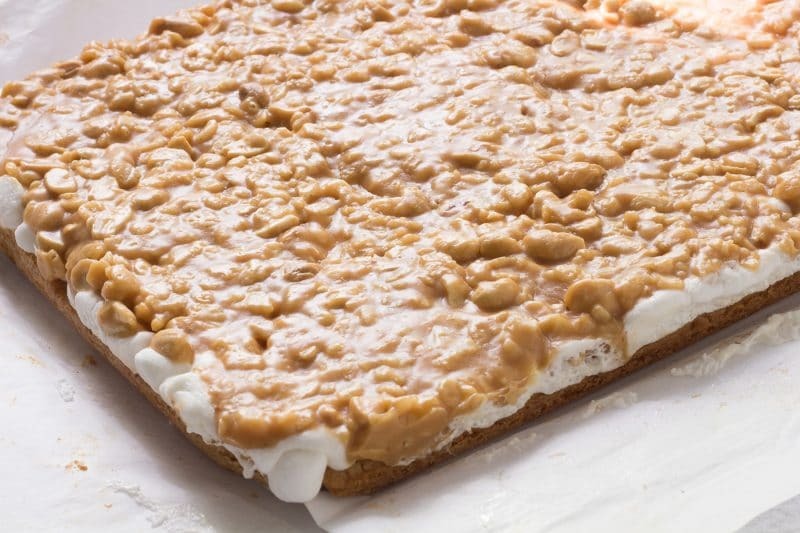 Salted Peanut Marshmallow Bars recipe is one of the few recipes that I make using box mixes. This is a holdover recipe from my beginner cook days. This one is made with Yellow Cake Mix. Well, the crust layer is made with the mix with the addition of eggs and softened butter. I have never used another flavor for this recipe, but I suspect it would be perfectly fine to substitute another flavor. BUT, it probably won’t taste as close to a Payday Bar as one made with yellow cake mix. 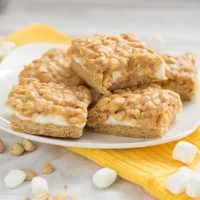 Makes sure all of the edges of the pan are covered with parchment paper or a non-stick aluminum foil followed up with a baking spray to keep the marshmallows from turning into glue. The mini marshmallows need to be ready to go as soon as the crust comes out of the oven. The residual heat will help the marshmallows melt. After adding the marshmallows, try to spread them out evenly. Move any marshmallows that are in piles and place them into areas that have the crust exposed. Dough will be thick. Wet hands to help press out evenly if necessary. Have the marshmallows ready to dump onto hot cake. Crust should be lighly browned on the top. Dump marshmallows onto hot cake as soon as it comes out of the oven. While Marshmallows are melting, cook the salted peanut topping. 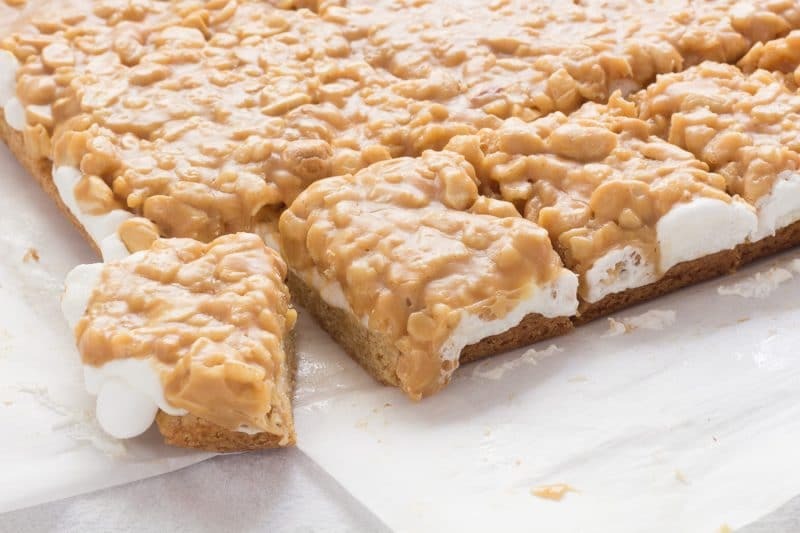 After peanut topping has been added and cooled slightly, remove bars from the pan by lifting with the parchment paper and peel parchment paper away from sides while marshmallows are still pliable. Turn off the oven when the crust is done, you may need to place the crust topped with marshmallows back into the oven to ensure melting. By melting, I mean they will flatten slightly and become very soft. Much like marshmallows do when cooked on top of sweet potatoes. While the marshmallows are melting, cook the topping. It is best to get the peanut topping added to the bars before the marshmallows get too cool. The topping is best spread by placing spoonfuls around the pan. It will spread out a bit on its own. The salted peanut topping will need a bit of help and encouragement to completely cover the top. 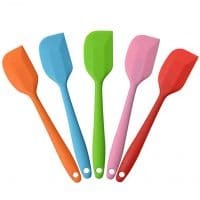 Keep gently nudging the filing with a small silicone spatula to fill in gaps with marshmallows peaking out. If there are places with a peanut “pile-up” go ahead and separate them using 2 forks if necessary. It will look bad when you do this, but as the mixture cools, the uneven areas will smooth out. The photos in this post are of a pan of Salted Peanut Marshmallow Bars I manhandled. You can see in the close-up photo below that the top smoothed out on it own. The edges with marshmallows peaking out can be cut off for cleaner edges. I do not do this because I am kind of lazy sometimes and I have never had anyone complain that there was a marshmallow bubble on their bar. 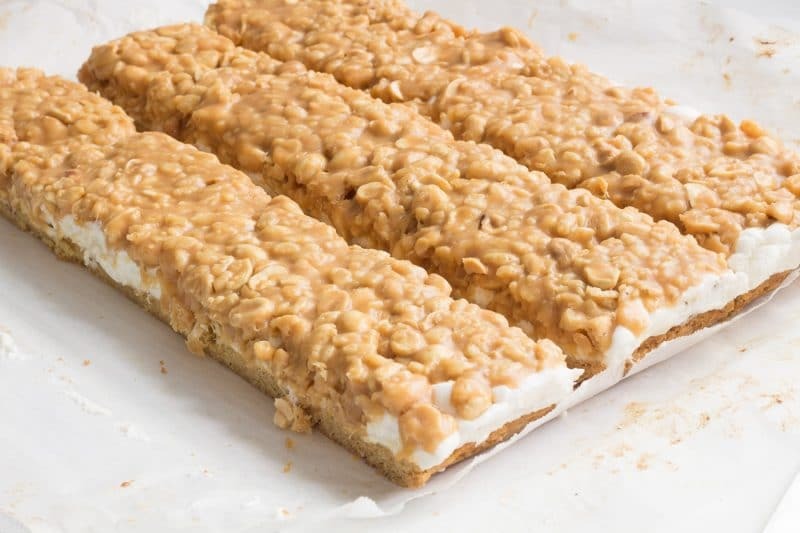 Recipe for Salted Peanut Marshmallow Bars. Easy to make and tastes similar to Payday Candy Bars. Great for afternoon snacks and lunchbox treats! 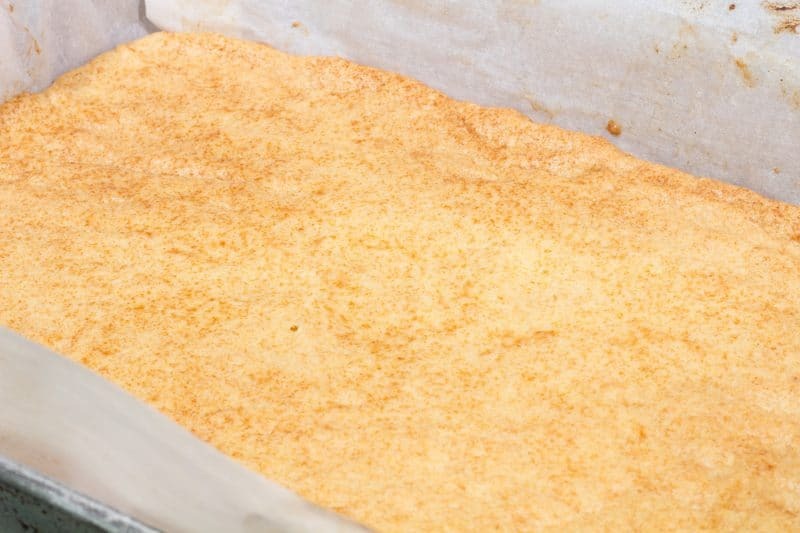 Prepare a 9 X 13 baking pan by lining bottom and sides with parchment paper and spraying with baking spray. 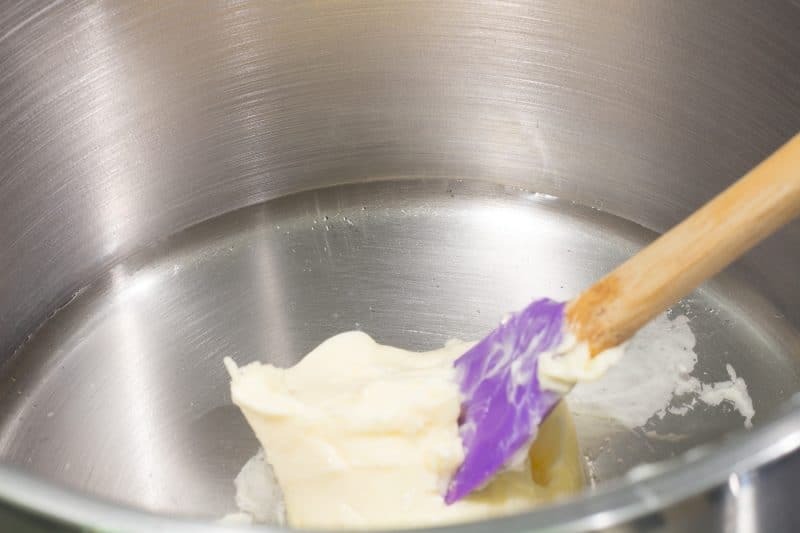 Combine cake mix, 1/3 cup of butter, and egg. Mix well until it forms a dough. 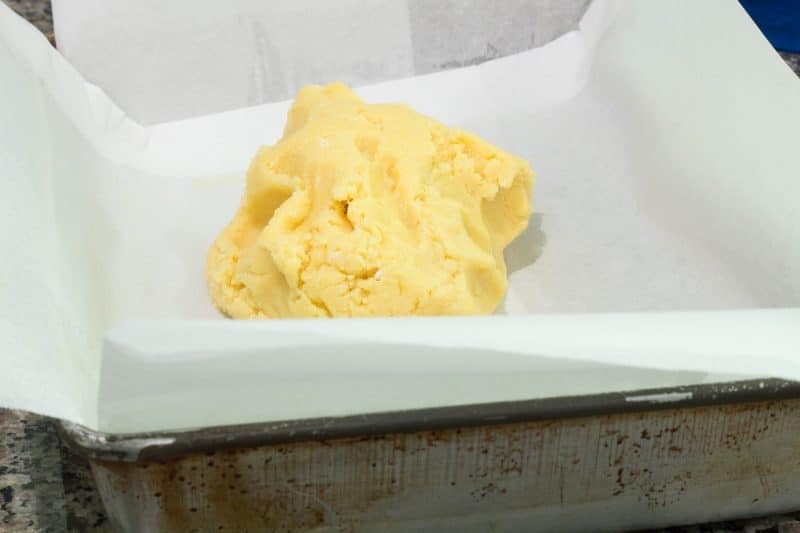 Place dough into prepared pan and press out dough into an even layer covering the entire bottom of the pan. Hands damped with water can be used to spread dough. 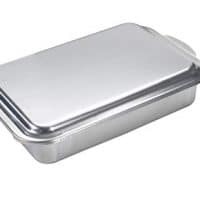 Place pan into preheated 350 Degree F oven and bake for 15 to 18 minutes or until the top is lightly browned. Remove from oven, turn off the oven and immediately place mini marshmallows on top of the hot crust, moving marshmallows as necessary to cover all of the crust and avoid marshmallow piles. Allow marshmallows to soften and flatten. 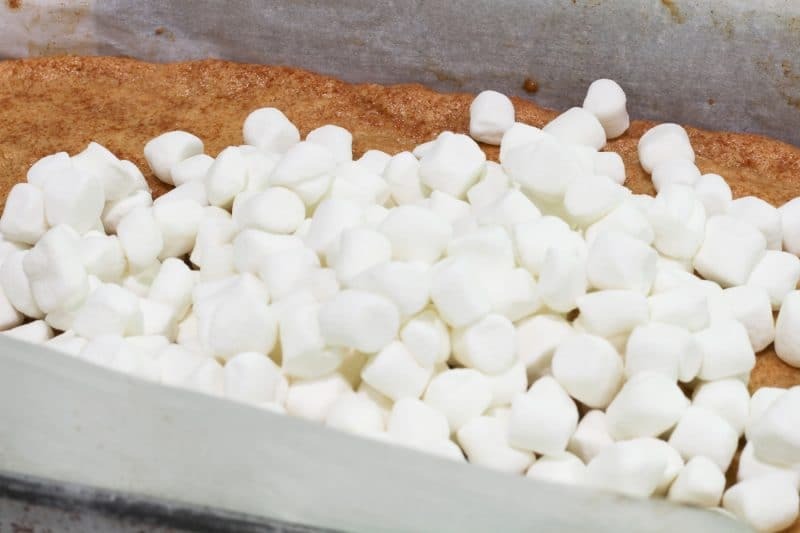 Crust topped with marshmallows can be placed back into the cooling oven for 3 to 5 minutes if marshmallows are not softening. 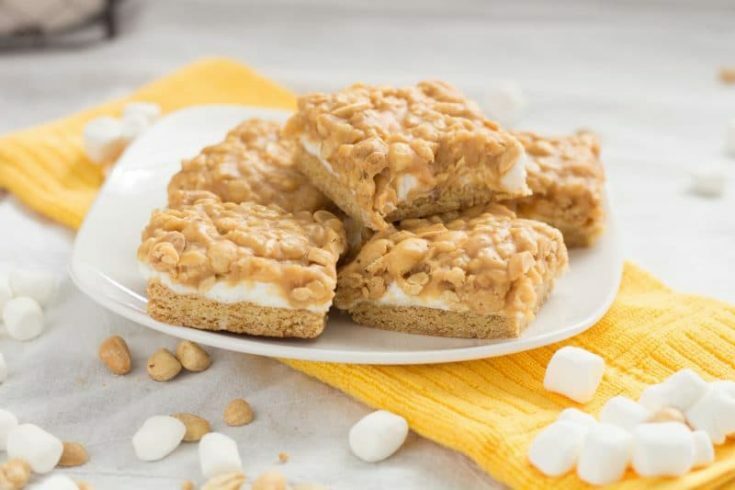 While marshmallows are softening, begin making salted peanut topping by place corn syrup and 1/4 cup of butter into a medium saucepan and cooking over medium-low heat until butter is melted. Remove from heat and add vanilla and peanut butter chips, mixing until all peanut butter chips are melted. Add salted peanuts and crispy rice cereal, mix until peanuts and cereal are coated with peanut butter mixture. 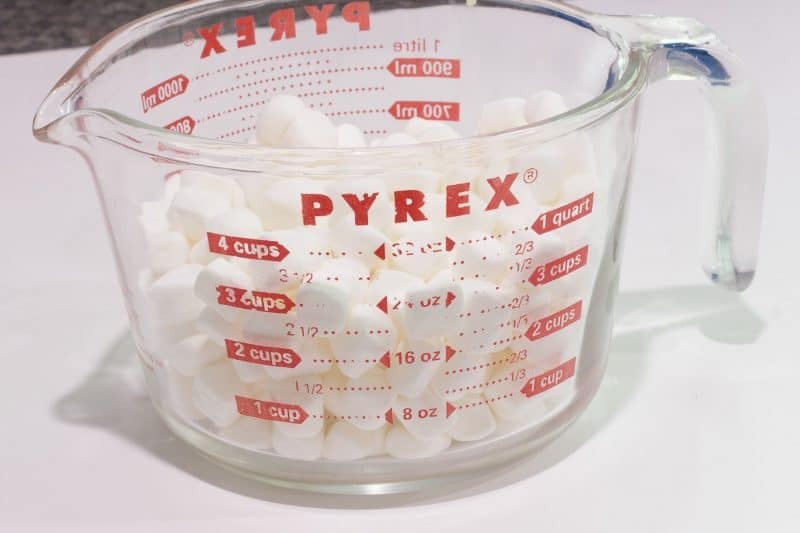 Place small spoons of hot mixture over softened marshmallows. Spread out with a knife, it will be thick and get thicker as it cools. Gently continue nudging peanuts to fill in areas of exposed marshmallows. These areas will smooth themselves out as the dish cools. Allow topping to cool and set slightly. Remove the pan of bars from the pan and place on a cooling rack. 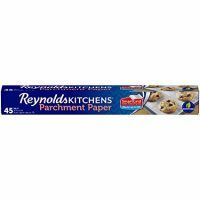 Peel back the parchment paper from the sides of the bars before the bars cool completely. This may require a sharp knife in some areas. Once cooled completely, cut into 24 bars. I sure did neglect to add that to my recipe! You will need to cover the entire hot base with mini marshmallows, 3 cups is a good starting point. Sometimes I need more marshmallows than that though.